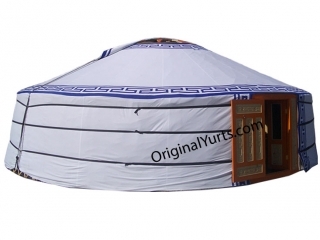 When you buy a yurt from us, a standard exterior cover (plain white) is included in the package. There is no need to buy the cover separately unless you want to have a second cover in reserve. Our standard covers are made of heavy-duty canvass and durable under constant use. 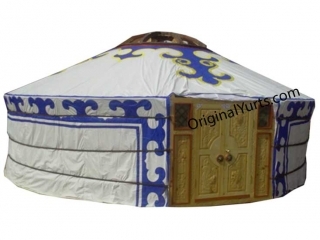 If you need a cover for your Mongolian yurt that was not purchased from us, we supply custom-made yurt covers. 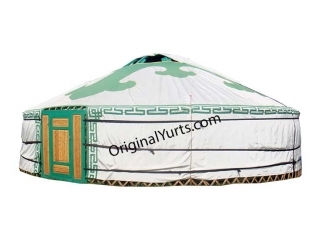 Our covers are much durable than the thin cotton exterior covers typically supplied by yurt importers. These thin cotton covers wear out and are torn down easily in 1-3 years. 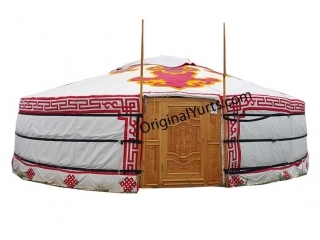 Our covers are directly shipped from Mongolia to your country. 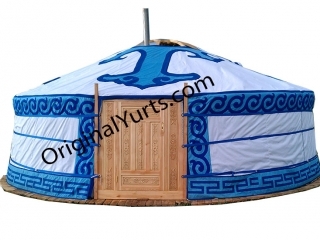 Production of the cover for an average yurt takes 1-2 weeks. Shipping from Mongolia to the U.S and Europe will take approximately two weeks. In addition to Mongolian traditional yurt decorations, we can make any custom decorations including banners of your favorite teams, universities cities, etc. We recommend plain white cover (without any decorations) made of heavy duty canvass because plain white covers do not fade in the sun quickly. 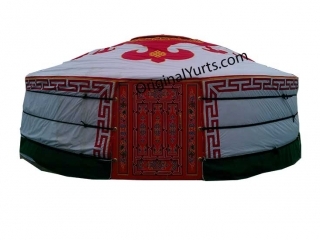 However, covers decorated with various traditional Mongolian patterns are available. Please check the album below for some design choices. Prices start from US$ 500. 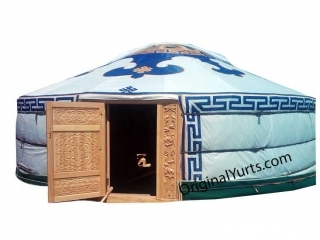 Prices differ depending on size of your yurt and level of decorations. We offer significant discounts on orders for two or more covers. 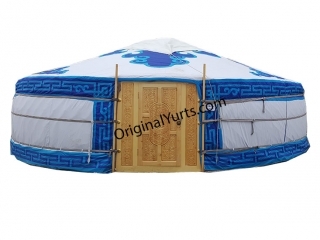 Please contact us for quotes for your yurt cover, shipping cost estimations and any other questions. If you are ready to place your order after communicating with us, please use our “How to Pay” page to make payments. 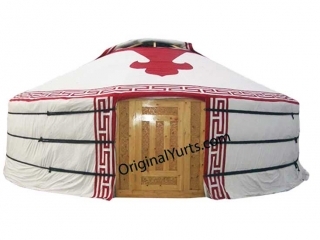 We would need specific measurements of your yurt in order to tailor the cover to fit your yurt. We will provide instructions for measurements after we receive the payments. Accuracy of these measurements are very important for exact fit. We would like to ask you to be careful when taking the measurements and double check.